Today we released a new build of PowerShell Studio 2017 (v5.4.137). In this build we added a number of new features, including some user requests, and made some improvements on existing features. 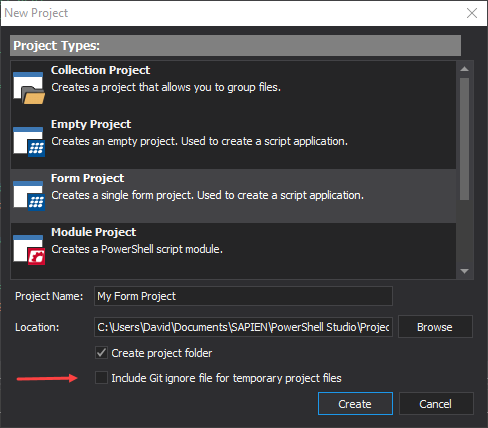 For those of you who use Git, we added a new option to project creation that includes a .gitignore file prefilled with filters for PowerShell Studio’s temporary files. 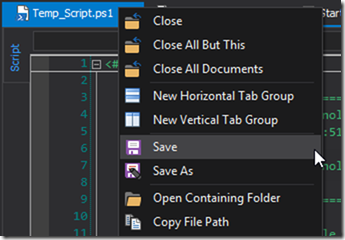 If you have an existing project, you can insert a .gitignore file using the Project panel context menu. If the project file already contains a .gitignore file, it will automatically append the project temporary file filters to the existing file. Do you have an existing module that you wish to edit in PowerShell Studio, but don’t have a project? 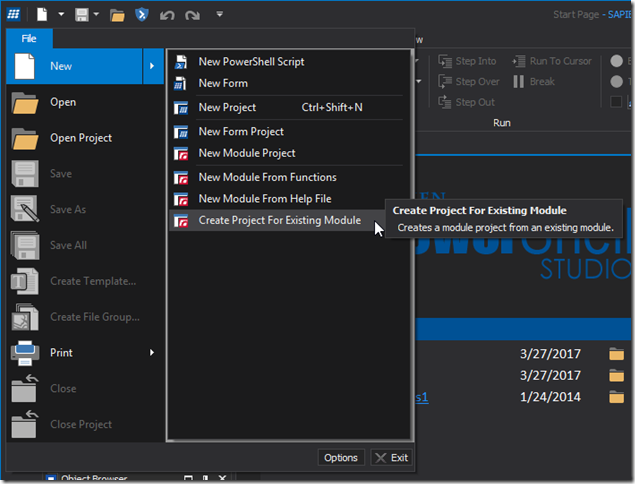 No problem, the new Create Project from Existing Module command will create a PowerShell Studio Module Project to use for your existing script module. When you use the command, it will ask you to select the module’s psm1 or psd1 file. You are then presented with the following dialog. The project will be created in a separate project folder and the module’s contents will be copied over to the new project’s folder. This folder location is determined by the Location field. It is recommended to make a copy of the module for the project, especially if the module is located in My Documents\WindowsPowerShell\Modules folder. The project will build and export the module to My Documents\WindowsPowerShell\Modules folder for you. When selected, the project will be created in the same directory as the module. 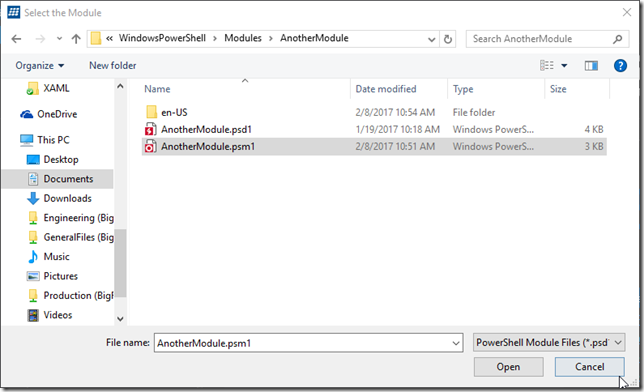 If the module is located in the My Documents\WindowsPowerShell\Modules folder, PowerShell Studio will not allow you to export the module in order to prevent accidental overwriting of existing files. 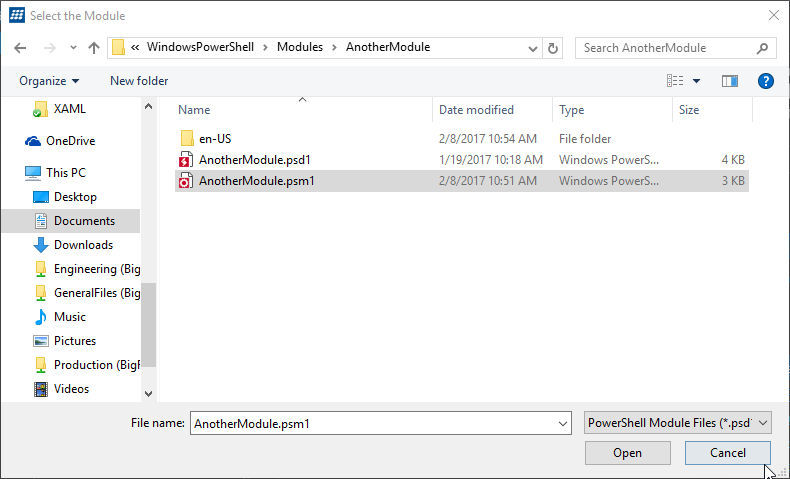 When checked, PowerShell Studio will create a subfolder using the module’s name in the Location path. 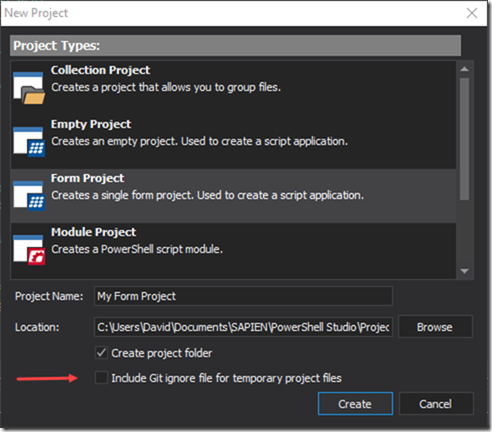 When checked, PowerShell Studio will create a .gitingore file, for Git source control, that filters out any temporary project files. 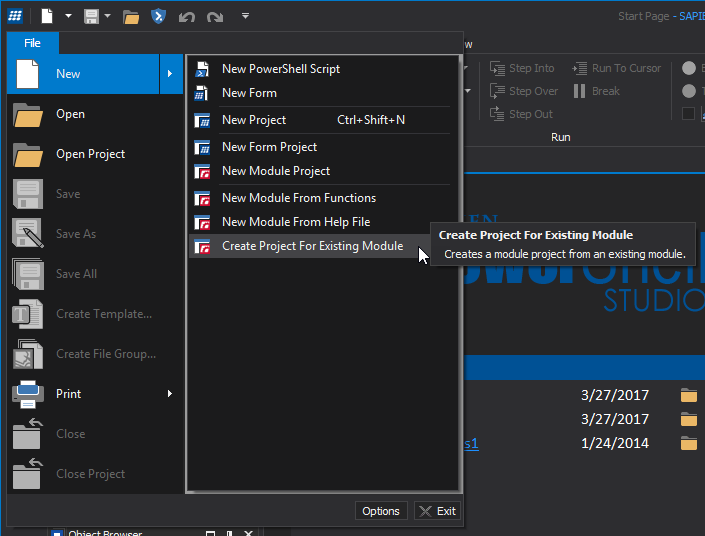 After selecting your options, press the Create Project button and PowerShell Studio will create the project for your existing module. 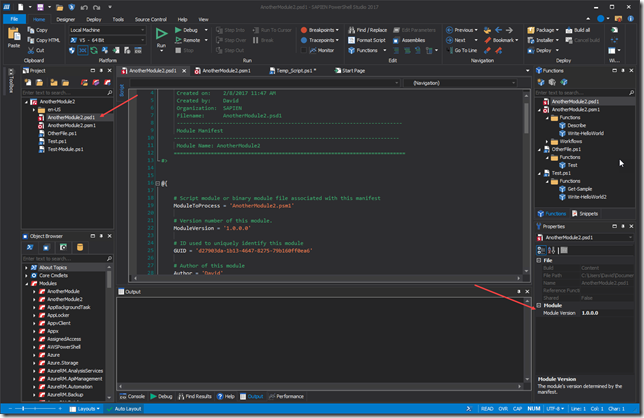 Note: If the project doesn’t contain an existing manifest psd1 or a psm1 file, PowerShell Studio will automatically create one for you. With this build, you can now modify a module manifest’s ModuleVersion directly from the Properties panel. You can do this by selecting the psd1 file in the Project panel and then use the Properties panel to edit the version. With this feature, you no longer need to open the manifest to edit the module’s version. We added another requested feature, which is the ability to collapse multi-line strings in the editor. You can also choose to include strings when using the Collapse All and Expand All commands. As per your request, we included a history for the Find / Replace dialog. You can now access your find history via a dropdown list within the Find What field. 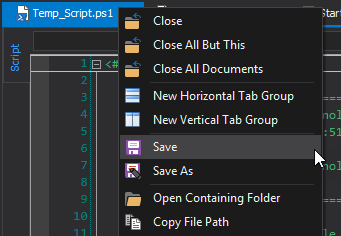 As per your request, we added the save commands to the document tab context menu. Last service release we introduced the new Splat Command feature. We improved the Splat Command so that it takes into account commands that are part of an existing statement, such as an assignment or piping, without breaking the structure of the statement. The parameters hashtable name now incorporates the command’s name in order to help prevent conflicts when splatting multiple commands within a single pipe statement. PowerShell Studio will now evaluate environmental variables in order to provide PrimalSense for folders and file paths. 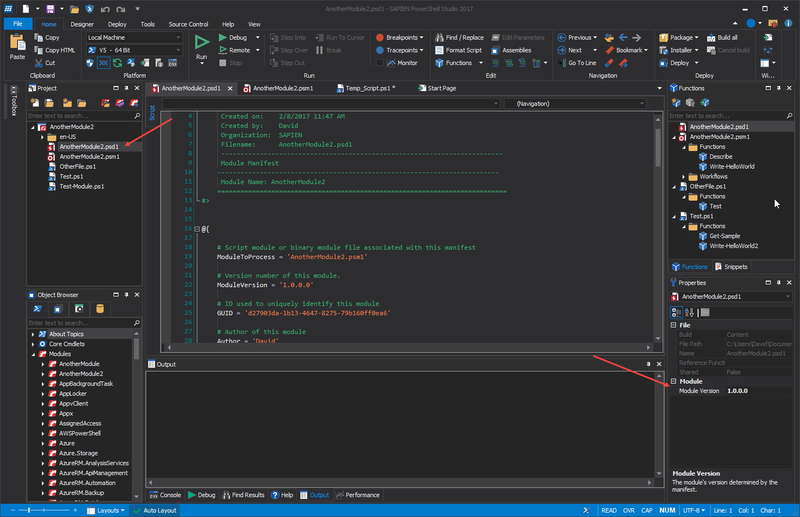 Buy PowerShell Studio 2017, Get PowerShell HelpWriter 2017 for free!